Piercings are a common accessory for both teens and adults. Earlobe piercings often heal without problems, but body piercings are a different story. These piercings are more risky and can result in infections even if they are done properly. Dr. Joel Schlessinger explains the pitfalls of body piercing. Piercings in areas with significant bacteria can become infected, explains Dr. Joel Schlessinger. Infection is a common concern for new and even older piercings. Pierced skin leaves an open wound that is vulnerable to contamination. The upper areas of the ears and the nose, both common spots for piercings, are made up of cartilage. These areas are often harder to clean, take longer to heal and are more likely to become infected at any time after a piercing. Additionally, clothing can trap dirt and other activities can lead to infections. Serious infections often require the piercing to be removed and can even lead to loss of an ear or nasal deformity if severe. Once removed, the piercing may cause scarring. If you do decide to get a piercing, make sure the person doing the piercing is an experienced professional, Dr. Joel Schlessinger says. To minimize the risk of infection and other complications, always see a reputable and trained professional for piercings. The challenge with this is that there aren’t any serious regulations on body piercing and you could have one done in a mall or by a person with zero experience or talent. The area should be cleaned with alcohol very carefully before the piercing is done. The person who is doing the piercing should be wearing gloves and professionally trained on equipment and procedures. Sadly, there is no way to assure this other than by word of mouth. Try to make sure the environment and equipment have been sterilized. Without sterilization, there is a risk of spreading diseases such as hepatitis B, hepatitis C or HIV. Blood infections, or sepsis, can also occur if the person doesn’t use a sterile technique. If you have doubts about the cleanliness of the environment, leave immediately. Problems with the type of jewelry can also be an issue, specifically if you have metal allergies. Make sure the jewelry used is hypoallergenic and the item is designed to be used with your specific piercing. Don’t remove the jewelry while the area is healing as this can cause more irritation. Dr. Joel Schlessinger shares how important it is to care for your skin if you do decide to get a new piercing. If you do decide to get a piercing (whichever area you choose), proper hygiene is essential to avoid infection and other complications. Gently clean the skin around the piercing twice a day using a cotton ball or pad dipped in rubbing alcohol to disinfect the area and prevent scabbing. If the piercing site becomes very tender or red, it’s important to see a board-certified dermatologist as these could be signs of an infection. Acne scarring of any kind can serve as a painful reminder of previous breakouts, and it can distract from otherwise healthy skin. Pitted scars, also known as depressed scars, come in many shapes and sizes. These scars are characterized by narrow, round or boxy depressions in the skin, and they often occur in clusters or patches. Pitted scars form when excessive inflammation occurs, causing a break in the follicle wall. The deeper the inflammation, the more likely there will be tissue loss, and a visible depression left behind on the skin. Consult with a board-certified dermatologist like Dr. Joel Schlessinger about scar treatment. Pitted acne scarring will not fade away on its own. In order to successfully minimize its appearance, you will need to consult with an experienced, board-certified dermatologist to help determine the best course of treatment. Though there are no over-the-counter or prescription topical treatments known to effectively reduce the appearance of pitted scarring long-term, there are several professional procedures that can make a significant improvement. Dr. Joel Schlessinger recommends the Fraxel laser resurfacing treatment to help minimize acne scarring. CO2 laser resurfacing has long been regarded as the gold standard for effectively treating a variety of skin concerns, including fine lines, hyperpigmentation and scars. 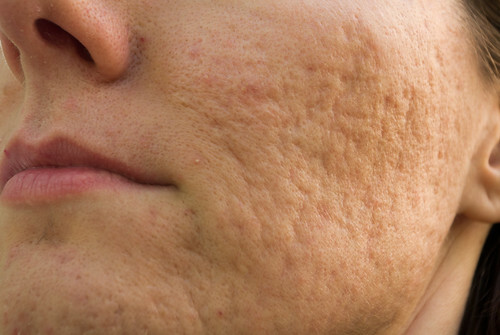 More recently, new developments in laser technology have made this option even safer for the treatment of acne scars. Fraxel is a semi-ablative procedure that is founded on the skin’s natural healing processes. During the procedure, microscopic laser wounds are spaced evenly across the skin to help stimulate renewal and repair. This jumpstarts the production of healthy collagen so that instead of experiencing immediate results, Fraxel allows skin to continue to rejuvenate and improve in tone and texture over a period of about six months. Fraxel laser resurfacing also features a new delivery system that helps the laser’s tiny microbeams penetrate the skin while leaving healthy tissue behind. With healthy tissue intact, the healing process is expedited, and usually only one session is needed to produce visible results. The best way to avoid pitted acne scars is to treat acne early on, says Dr. Joel Schlessinger. Even with advanced treatments like Fraxel, the results are not permanent, and there is no way to completely eradicate the appearance of deep pitted scars. The best way to avoid pitted acne scarring is to seek professional treatment for acne early, usually as a pre-teen or teen when the initial mild to moderate breakouts appear. Do you have a question for Dr. Schlessinger about treating pitted acne scars? Let us know in the comments section. Skin purging: fact or fiction? Joel Schlessinger MD has the answer. There is a common myth in skin care that starting a new treatment or regimen leads to skin purging. The idea is that when you start a new skin care treatment, breakouts are a good sign because your skin is purging itself of impurities. But is there any truth behind this myth? Read on to find out. 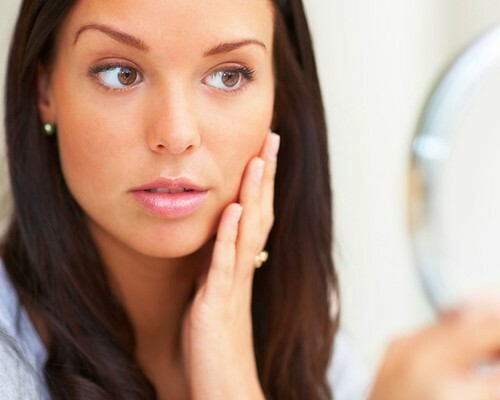 Your skin can react to any change in your daily routine, Joel Schlessinger MD explains. When your skin reacts to a new product, it’s not purging itself of impurities. In fact, it’s the skin’s job to keep things out, not detoxify the body. Any reaction you’re seeing to a new product is the skin naturally trying to restore balance. This can happen whenever you make a change to your skin care routine. Another explanation could be that you’re having a reaction to the ingredients in the products. Products that contain alcohol, fragrance or other additives can sometimes cause irritation. Additionally, if you’re using products with too many active ingredients, this can cause skin to become overly sensitive. The products in your skin care routine should work together to improve your skin. Joel Schlessinger MD says it’s important to determine what caused the reaction and adjust accordingly. If you notice a sudden breakout or increased sensitivity, stop using any new products and see if the reaction clears. Once your skin calms down, you can slowly add products back into your routine. Try only applying formulas every other day or alternating treatments in the morning and the evening. If the reaction persists, it’s time to see a dermatologist.